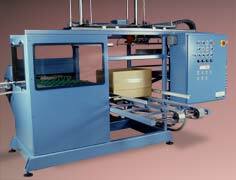 The LP-1000 Layer Pac Case Loader is manufactured by GGA Packaging. The Model LP-1000 is an automated Layer Pac case loader that will load highly decorated product without damage. The LP-1000 will load nested or stacked product into cases or trays with or without layer separators. It can form any of three types of layers of even highly decorated and odd shaped product - square pack, offset pack, or offset less one pack - on a live matrix generating table, which features non-contact product handling. The LP-1000 will accommodate open erected cases up to a 29" cube in size.